Shenanigans ensue as they go out and party the night away. Meanwhile, jerkface Ted starts to suspect something is up, while Valerie and the captain of the alien ship, Mac (Jeff Goldblum) fall in love. A see-through hot pink swimsuit, just like grandma used to wear. Earth Girls Are Easy (1988) exists solely as a vehicle for beefcake and cheesecake. Okay, sure, there are some musical numbers, and Julie Brown’s script and pop songs are a hoot — why she didn’t have a bigger career, I’ll never know — and the film even dips into the shallow end of social commentary at times, but for the most part, it’s meant to be fun. Just fun. And folks, there is nothing wrong with fun. Critics were frequently turned off by what they felt was a nonexistent plot, and some even considered it a thin excuse for director Julien Temple’s to work through his own angst over being an outsider in Hollywood. Temple had sold Warner Bros. on the idea of the film as far back as early 1986, but when his Absolute Beginners became a notorious flop, no big names wanted to sign on. Eventually, private financing and distribution from De Laurentiis were secured, but De Laurentiis went bankrupt just as the film wrapped. Finished in 1987, it was picked up by Vestron Video but didn’t go on the festival circuit until 1988 and wasn’t put into wide release until 1989, after Geena Davis won an Oscar and Vestron felt they could recoup some of the cost. Unfortunately, they felt wrong; the film lost money until repeated showings on cable made it a cult hit in the 1990s. Still, the delay between filming and release surely affected its reception. By the summer of 1989, people were less interested in a wacky take on 1980s consumerism and consumption and looking forward to the next decade. Co-stars Jim Carrey and Damon Wayans had both been in several films in smaller but featured roles, but were still months away from their break-out performances on “In Living Color.” The timing of Earth Girls, quite simply, stunk. Two years earlier and it could have been a fun summer hit, two years later and it would have cashed in on what people would finally recognize as a terrific cast. Aliens plus lawn sprinkler equals funny. The performances are, without question, terrific. Geena Davis is the perfect mix of wide-eyed ingenue and crafty Valley girl. Julie Brown is vivacious and fun, and Wayans and Carrey are both funny in the exact way you remember them being funny in the late 1980s. Rocket and McKean are solid supporting players. The surprise here is Jeff Goldblum, who is so intense it’s as though he’s acting in another movie; a couple of years ago, The Independent noted he was “worryingly convincing” as a fuzzy blue alien. And he is. There’s so much to talk about here in terms of the musical numbers, the way the aliens act and speak, the amazing details in the props and the little cameos of inanimate objects, but to reveal these things would be to take away from the film’s core strength. This is the kind of movie that movie buffs put on late at night and enjoy for the details, and for the sheer exuberance of it all. That’s how you watch it. Look at Earth Girls too closely and you miss what’s important. And now, an interlude: What animated sci-fi comedy series do these screen captures remind you of? Cameo by Robbie the Robot. The same can’t be said for the music, which is a hit-and-miss grab bag of pop, pop pastiche and enormous musical mistakes that surely must have been investigated by The Hague. As a connoisseur of both the esteemed Mr. Hall and the lovely Mr. Oates, I can say with absolutely no hyperbole whatsoever that their version of “Love Train” is a crime against humanity. That said, the version they performed recently on “Live from Daryl’s House” with Billy Ocean and Maxi Priest has redeemed them quite a bit, and much has been forgiven. In Earth Girls, Valerie’s plight mirrors that of many hapless women in scores of 1950s sci-fi and horror flicks. She’s abandoned by the man who is supposed to take care of her and becomes the victim, if you will, of alien men who only come into her life because of her willfulness. Unlike previous generations, Valerie is shown as a woman with options and a lot of personal agency. but the best is the black and white nightmare stuffed with dozens of characters ripped from the frames of sci-fi horror flicks. It’s a lot of fun purely on an entertainment level, but to an extent, also represents the modern woman’s worries of going back to the not-so-good old days, and is the film’s sly jab at “old fashioned” science fiction. Or would be were creatures from recent (at the time) movies like They Live and Buckaroo Banzai not also included. Sure, the Banzai quote was an easy call, as Jeff Goldblum had co-starred in that film, but it breaks the fourth wall in a kind of goofy way. It’s not that Earth Girls botched their message, exactly, but that the film chose to present the message in a softer way, which is what makes it still so delightful 25 years after it was finally released. 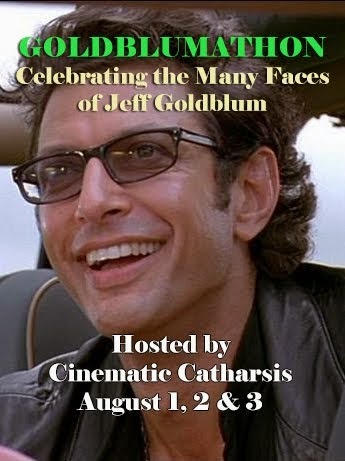 This is the SBBN entry for the fabulous Goldblumathon, hosted by Barry at Cinematic Catharsis! Hop on over and check out all the other entries today — you won’t be disappointed! Glad to see I’m not the only one with affection for this bit of ’80s fluff. I was one of the dozen or so people who saw (and enjoyed) Earth Girls Are Easy during its theatrical run, so I’m pleased it didn’t vanish into complete obscurity. Thanks again for joining the Blogathon. Great entry! I saw it the theater, largely because I liked Julie Brown’s EP, “Goddess in Progress,” which supplied both the movie’s title tune, and Brown’s comes-out-of-nowhere-but-who-cares?-Beach-Party-number, “Cause I’m a Blonde.” Her show on MTV, “Just Say Julie” was pretty funny, too. I also saw this originally in the theater (ah, youth)…which might be why I wasn’t as charitable to it as others over the years because it’s the cinematic nutritional equivalent of cotton candy. It’s improved with age, however, and if you can catch it on cable (where you can appreciate the sci-fi references you site) it’s a pretty enjoyable romp. Just wanted to chime in here and agree that Earth Girls Are Easy is major fun. And I’m not a big fan of rom-coms. I missed it in its theatrical run, but my DVD gets hauled out and played at least once a year. Bahahaha. 2001 Flavours. I liked this when I saw it but it has been a while. Even the Mask hasn’t been shown for ages. Not 20 minutes ago, I had to stop myself from posting on someone’s Facebook post, “It wasn’t ME, it was the ONE-ARMED MAN.” And god help me, I still own the soundtrack to The Mask.